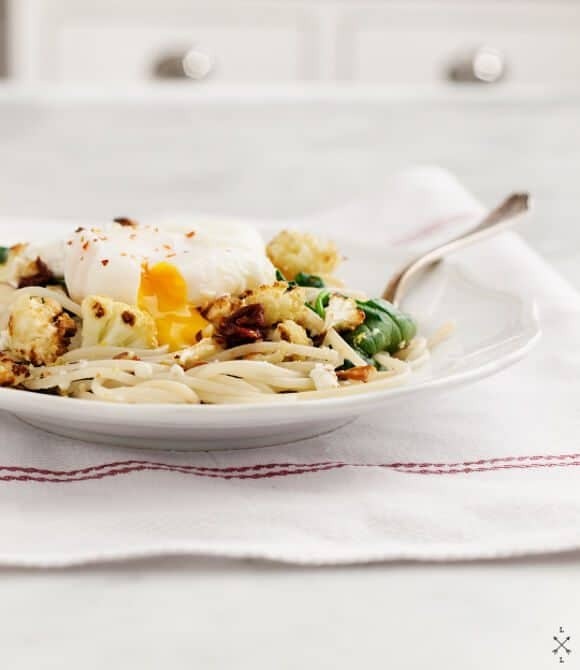 This roasted cauliflower pasta is a simple & healthy vegetarian weeknight dinner. Lemon, basil & sun-dried tomatoes give it irresistible pops of flavor! Well, what can I say, I was obsessed with my cauliflower mission. Plus, it was a cold and rainy night, and this dinner felt warm and cozy. (Well, ok, it was warm when I reheated it after the photos were done… but still). I’m strange about holidays… I just think celebrations should be random. If I made a list of my favorite life moments, most of them did not happen on Christmas or my birthday, or even on my wedding day (family, pretend I didn’t just say that)… they happened on some random Tuesday, at a time and place that I never expected. To me, expectation muddles things. I’d rather Jack come home some weeknight and announce that we’re going to Uchiko (hint hint) than watch him stress about what to plan for my birthday. 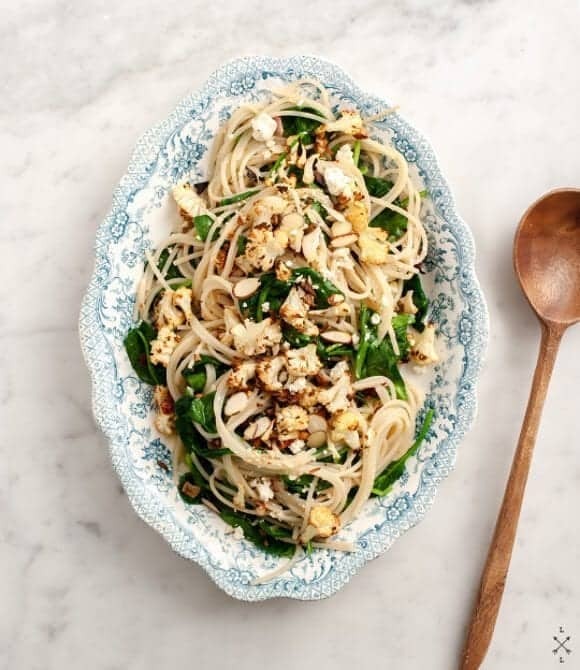 Now, about this roasted cauliflower pasta! This cauliflower pasta comes together simply. First, spread the cauliflower florets on a sheet pan in a single layer with the chopped shallots & garlic, sea salt, and black pepper. Then, roast it in a 450-degree oven until it’s golden brown and has a wonderful nutty flavor. While your cauliflower roasts, toss the hot cooked pasta with a little starchy pasta water and a handful of spinach, letting the hot pasta water wilt the greens into the pasta. Finally, stir together the roasted veggies, the pasta & greens, lemon juice & zest, sun-dried tomatoes, and fresh herbs. Top it all with crispy toasted almonds, and you have a delicious combination of bright, fresh, nutty, and briny flavors. In short, this is one satisfying, easy dinner. Sprinkle some feta cheese on top for a tangy, creamy pop. Swap out the herbs for different cozy, fresh, or savory flavors. Tarragon, parsley, or thyme would all be excellent here. Dust your pasta with bread crumbs for a little crispy texture. Finish it with a poached egg for a creamy, sauce-like addition and some extra protein. 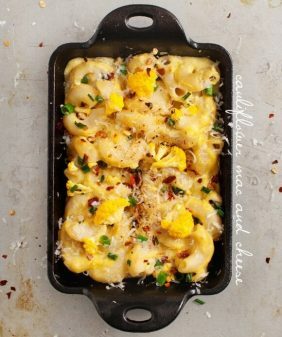 If you make this cauliflower pasta, please let me know in the comments! I love hearing from you. 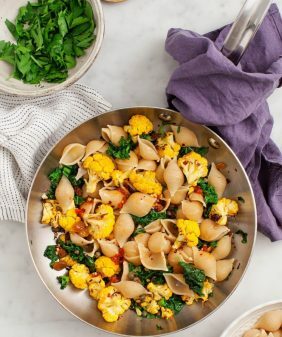 This simple roasted cauliflower pasta is a healthy vegetarian weeknight dinner. We love its flavors of lemon, sun-dried tomatoes, and herbs. Roast cauliflower, shallots, and garlic in a 450 degree oven for 20-30 minutes. Be sure not to chop your garlic too small or it will burn before the cauliflower is done. Once it's golden brown, remove from the oven. Mix it all together and taste a piece, it should taste nutty and delicious. If it doesn't, add a small drizzle of olive oil, a teeny bit more garlic, and a pinch of salt if necessary. Set aside. Cook your pasta for about 8 minutes or until it's done but al dente. Place spinach in a large bowl, and scoop your pasta noodles into the bowl with the spinach and toss so the spinach begins to wilt. Add some pasta water to help that along. Next add half the roasted veggies, another drizzle of olive oil, a good squeeze of lemon, some lemon zest, sun-dried tomatoes, feta, and basil, and toss everything together. Taste and adjust seasonings. Top with the rest of the roasted cauliflower and the toasted bread crumbs & almonds. (Serve with poached eggs if you like). Glad you made such good use of that giant cauliflower! This looks delicious. This looks perfect for those huge heads of cauliflower, so good! Ohmygosh. I totally agree with the best life moments happening on a whim. I planned our wedding for a year and a half only to have both me and my husband end up with the stomach flu the day of the event…puking in my wedding dress in the reception hall bushes no less. From that moment on, I’m all about the surprise, random celebrations! Can’t wait to try this recipe out. I have cauliflower burning a hole in my frig. oh my, that sounds horrible! I seriously stressed about becoming sick on my wedding day… luckily didn’t happen but, oh, what a stressful time. That looks so delish! I am a big fan of cauliflower. First of all, Happy Birthday! Second, this dish looks divine! I have a head of cauliflower that now finally has a purpose. Oooh! Nothing feels more decadent than a creamy poached egg on top. What a perfect birthday meal. My birthday is in a week and low key is my ideal night as well. Happy birthday! Ohhhhhhhh myyyyyy heaaaart. Love this. Happy Birthday! I totally love going out on regular days instead of the expected ones, so much more unexpected and exciting. 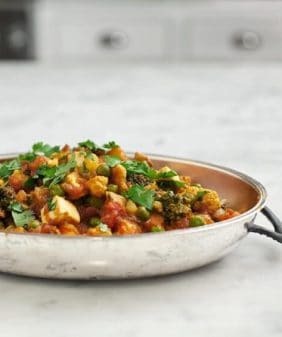 Besides, this cauliflower dish looks worthy of any b-day meal! I love your new mission – and congrats on the birhday! One of my new cauliflower mission for the season is pickled cauliflower and cauliflower green curry. I can’t wait to see what you’ve got up your sleeves! Sounds wonderful! I think I’ll replace the feta with pecorino romano. Happy birthday! That egg put this already delicious-looking dish right over the edge for me. Further proof that everything is better when topped with an egg. This looks like my kind of birthday dinner! And that egg?? Ahhh. Perfection! p.s. My mom LOVED the recipe cards. 🙂 I just got to give them to her last week when I came home for a visit. I filled them with simple recipes I knew she + my dad would enjoy. oh I’m so glad… I think handwritten recipes are so precious… a dying art that should be kept alive!! Happy belated birthday love! Your sisters comment made me laugh 🙂 Your cauliflower pasta looks yumo. I agree with you about birthdays and holidays. After my childhood years, the expectations of holidays removed what was joyful about them in the first place. My “holidays” are the traditions that my friends and I have started and find so much joy in, mostly just from being together. I totally agree with your perspective on birthdays and celebrations. 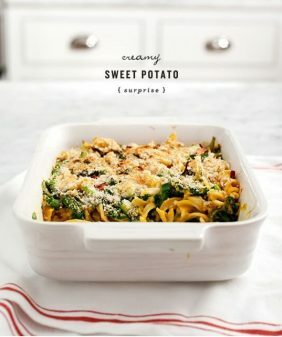 I think every day should be special in its own way and this cauliflower pasta sounds like the perfect way to make a day seem special, birthday or not. Happy Birthday Jeanine! I love roast cauliflower but have never added it to a pasta before. Thanks for the inspiration! 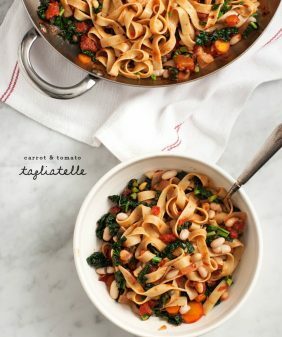 Love this simple pasta. Looks lovely! I love the egg! I don’t know why I’ve never thought of topping pasta with a poached egg — I top everything else with them. 😉 Beautiful. I totally agree with you about random nights. The best times come about naturally, not forced or planned. That egg on the pasta = to die for! This looks amazing! I want to try this now! Made this last night! Absolutely delicious! Wow, this looks amazing – and happy birthday! I adore roasted cauliflower and that combo has my mouth watering like crazy 🙂 Wonderful! 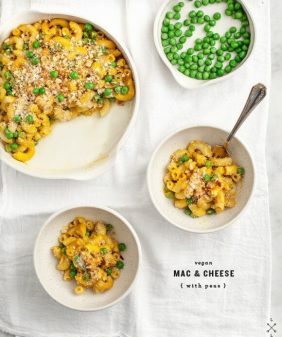 This looks delish, cannot wait to give it a whirl. Roasted cauliflower is incredible, and I can just imagine how good all those little charred end pieces are! Mmm. Happy belated birthday! I don’t know, a night at home with a big bowl of this in front of me pretty much sounds like a party right there. Beautiful. Oh my, this is good stuff! This pasta will not be going to the Superbowl party with me. I’m saving it for lunches this week. Thanks for the recipe! this is SO delicious. my boyfriend and i eat this, literally, once a week because we love it so much. thank you so much for sharing this! Oh, I’m so glad, thanks for sharing! I made this Sunday, splitting in half, thinking I’d bring the rest to work on Monday. It was so scrumptious I ate it all and am making it again tonight! Maybe I will add the egg this time, although it will be gilding the lily, so to speak. Scr -YUM-ptious. I’m so glad you liked it! Ha, we’re not good at saving leftovers either :). Just have to say that this was delicious, and will be going into a regular rotation of pasta dinners!!! Great recipe. A crowd favorite!